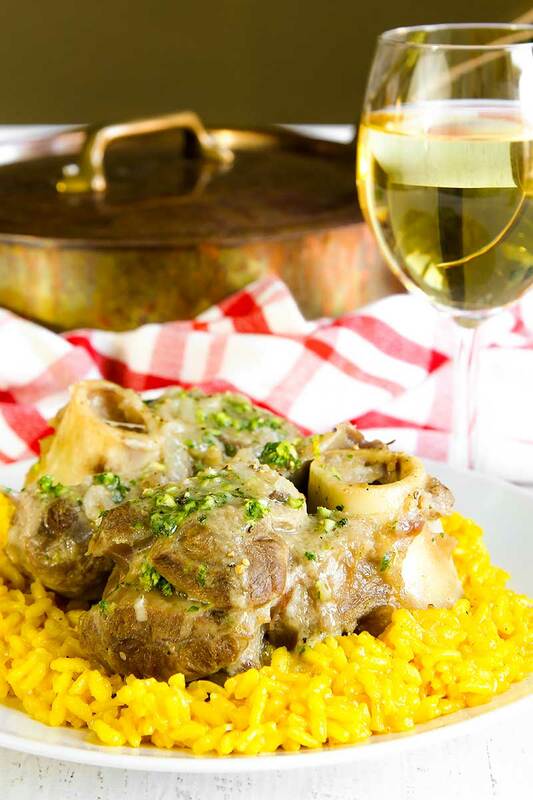 Osso buco Milanese recipe (named in Italy”Ossobuco alla milanese”) is a traditional entree, very popular in Milan. Today I propose you the authentic eighteen-century version. The floury veal shanks are slow-cooked with onions, and white wine. A mixture of fresh Italian parsley, lemon zest and fresh garlic called Gremolata complete this tasty Italian recipe! A perfect osso buco Milanese recipe requires steaks with bone taken from a milk-fed veal shank. The thickness have to be around 1 and 1.5 inches. Polenta and Italian mashed potatoes, are great choices as side for the Osso Buco Milanese. But, the most traditional combination is with risotto Milanese. (Click on the links to read the recipes). Wash and dry the pieces of osso buco. Heat the vegetable stock into a little pot until gently simmering. (click here to see my recipe). Pour 1 tbsp of butter in a thick-bottomed saucepan or a Dutch oven over medium heat, and melt it. When the butter is completely melted, add the onions finely sliced. Stir-fry the onions until extremely soft and translucent. When the onions are cooked, pour them into a dish, and cover with aluminum foil. Flour the meat, then pour 2 tbsp of butter in the same pot, and heat it over medium heat. When the butter is completely melted, add the pieces of osso buco. Roast the meat until golden on all the sides. Now, raise the flame and pour the white wine around the meat (not over!). When the alcohol of the wine has evaporated, add the hot stock to reach to half the height of the meat, and the cooked onions. Lower the heat and cover the pan. Cook the osso buco until the bone will begin to separate from the meat (a couple of hours more or less). During cooking, if necessary add a few tablespoons of broth. Meanwhile the meat is cooking, prepare the Gremolata: mince the fresh parsley with the lemon zest, and the clove of garlic. When the osso buco is cooked, pour the gremolata over the meat, and salt as needed. Complete the osso buco Milanese recipe with a sprinkling of black pepper and serve very hot. Osso buco Milanese recipe (named in Italy"Ossobuco alla milanese") is a traditional entree, very popular in Milan. Today I propose you the authentic eighteen-century version. 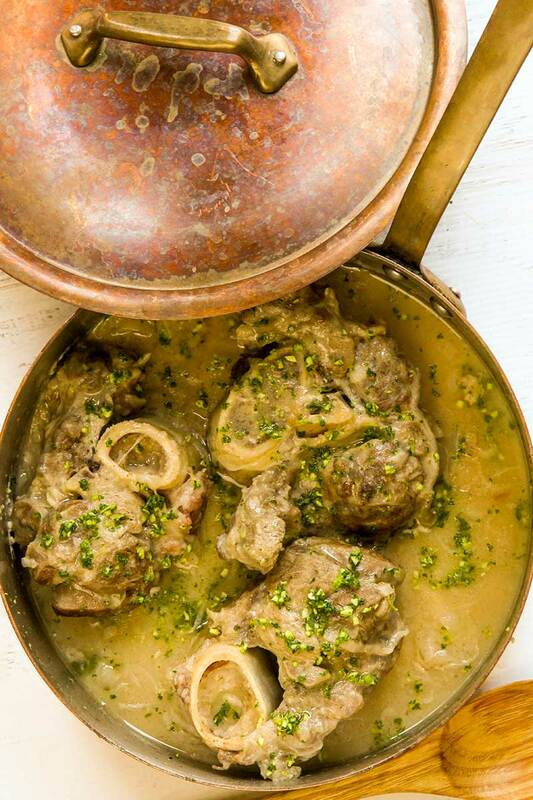 The floury veal shanks are slow-cooked with onions, and white wine. 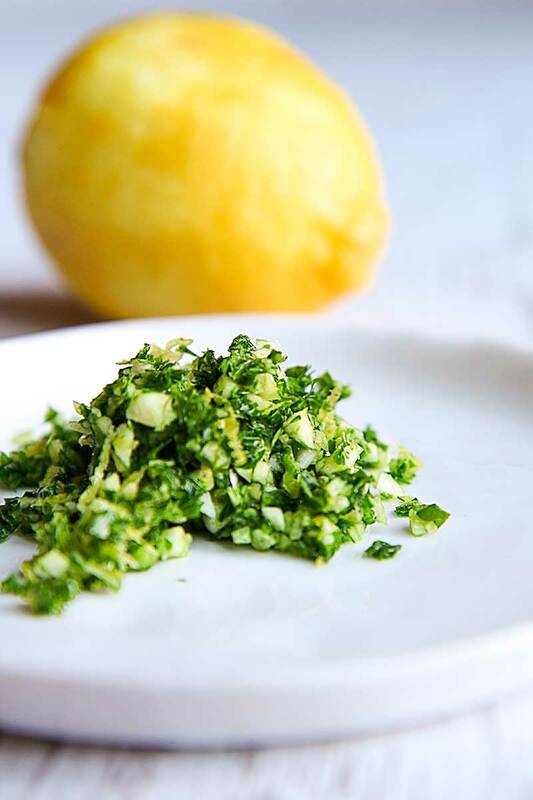 A mixture of fresh Italian parsley, lemon zest and fresh garlic called Gremolata complete this tasty Italian recipe! 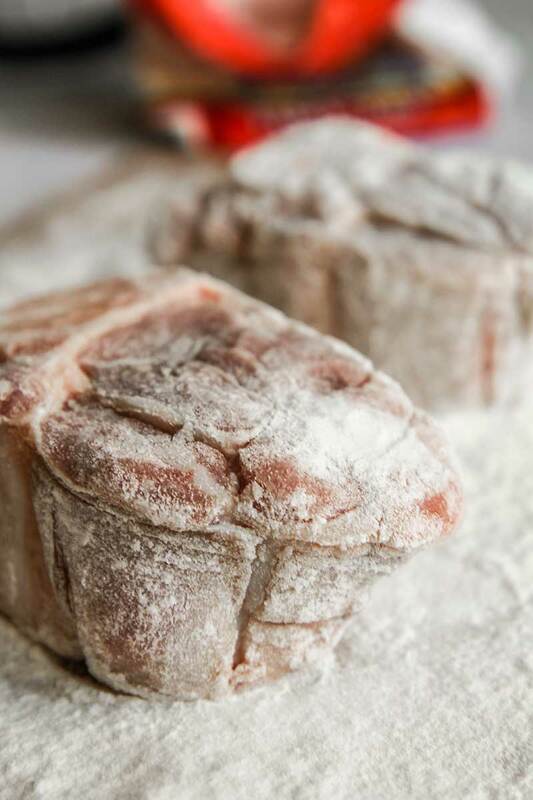 A perfect osso buco Milanese recipe requires steaks with bone taken from a milk-fed veal shank. The thickness have to be around 1 and 1.5 inches. Polenta and Italian mashed potatoes, are great choices as side for the Osso Buco Milanese. 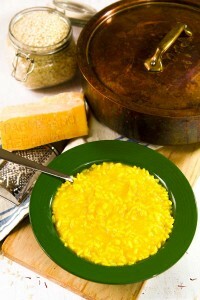 But, the most traditional combination is with risotto Milanese. Wash and dry the pieces of osso buco. Heat the vegetable stock into a little pot until gently simmering. Pour 1 tbsp of butter in a thick-bottomed saucepan or a Dutch oven over medium heat, and melt it. When the butter is completely melted, add the onions finely sliced. 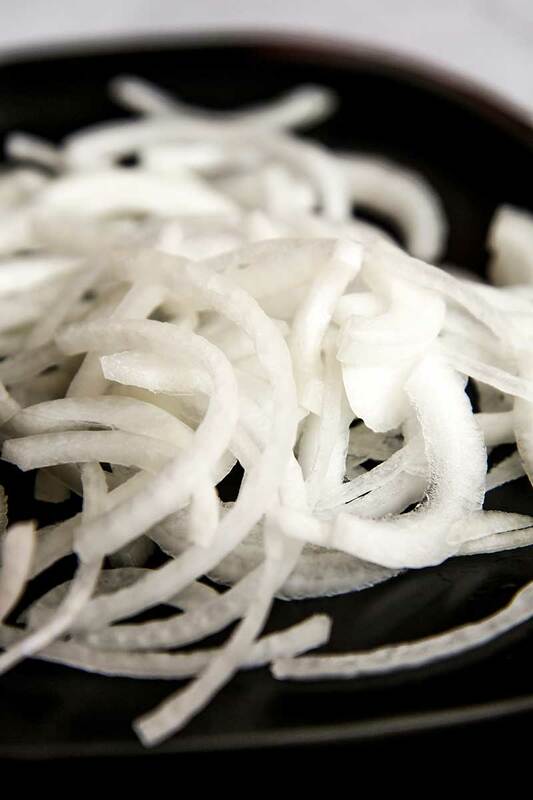 Stir-fry the onions until extremely soft and translucent.